The last seven days have seen the Jeonbuk juggernaut right itself after the Asian Champions League defeat to Bluewings with a victory in the Jeolla Derby over the Chuseok holiday. They now sit 16pts clear at the top of the league and are on course to have the title sewn up before the split. 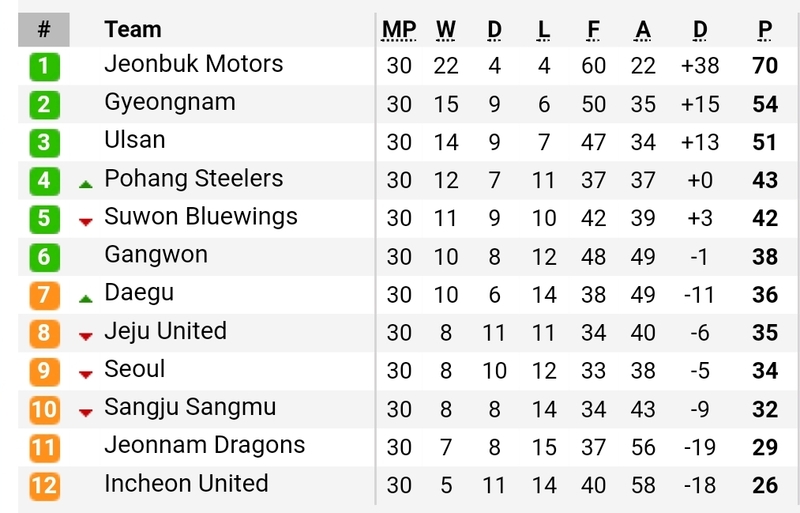 Back to back victories for Pohang have brought The Steelers ever so slightly into contention for an ACL spot while the ACL heroes from Suwon have gone five matches without a win in the league and find themselves down in 5th. The bottom half of the table is a little tighter than the top with only 9pts separating 8th and bottom placed Incheon. Incheon drew their last match against FC Seoul despite leading at half-time and given how poor they looked defensively in that match must be the favorites for relegation. Jeju, Daegu and Seoul all continue to battle it out for survival from the playoffs while Sangju look like they actually want to be in them with the Army losing three of their last five. I’m a newcomer to Korean football and recently picked up on the 48 Shades podcast & website and your kleaguekilt.com blog, excellent resources for getting into all things Korean football! I’m hoping to plan a trip to Japan next season to catch a few J-League games, a league I’ve been following for a while, and asked the guys at the J-Talk podcast for some practical advice, they promptly delivered in episode #244 a groundhopping special which was packed with useful information. Any feedback you might have would be appreciated – keep up the good work! sorry I just seen this message, I am actually planning on doing a section on the blog about all the stadiums including proximity, ticket prices and of course beers! I’m going to start it once the season finishes. There’s also the ROK Football Forum Facebook page https://www.facebook.com/groups/1879647298751449/ and https://the48club.wordpress.com/ which details one of the original 48 Shades hosts Stevie joining the 48 Club (visiting all 48 active football stadiums in Korea).